Information about the types of decay is given in the instructions so that it is possible to play this game without having already studied radioactivity. However, the game is best used after the topic has been introduced via textbook, lecture, or video. It is designed as a reinforcement activity. This card game can be played with as few as two players or as many as a dozen. 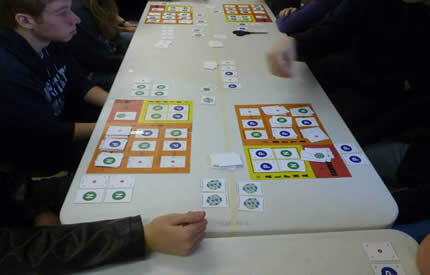 Players collect protons, neutrons, electrons, beta particles, positrons, and gamma rays in order to form a type of radiation, resulting in a transfer of an unstable nucleus card to the other team. The first player/team to get rid of all their unstable nuclei wins the game.